You may have noticed a new look to WindsorEats. We redesigned the site! Its actually been in the work for months and seeing it come to fruition has been very exciting. The new site will make WindsoreEats a powerful tool in promoting our region as a culinary destination. As Windsoreats grew over the years, our old site didn’t truly reflect where we were as a culinary guide. That has all changed. Welcome to the new and improved WindsorEats. We are now a better reflection of our community and our county. It is a better look at what we offer as a culinary destination, both for visitors and ourselves! There are so many details and new elements to the site we wanted to highlight them for you. WindsorEats has expanded our reach to all that is culinary in Windsor-Essex. With the expansion of reach, our website is now sorted out with more categories making it easier to zero in on what exactly you are looking for. If you’re looking for info on one of Windsor-Essex’s farmers markets, simply click on ‘Markets’, if you want to find a butcher, click on “Culinary Shops’, etc. When receiving feedback about our website, many people indicated the map of Windsor was a defining piece of it, but guess what? We still wanted to make it a better user experience. We’ve integrated Google Maps, making searching for a businesses and interactive process. Zoom in, out, choose a neighbourhood, etc. Each of our member businesses will also be pinned directly on the map. 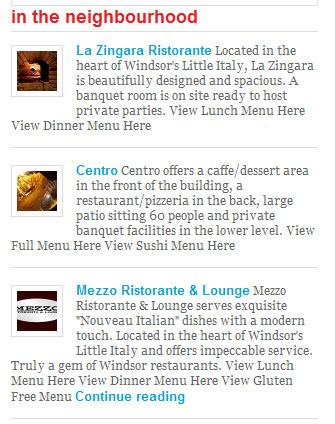 Click on each pin to get some more detail on that business and click on that info to be brought directly to their page. 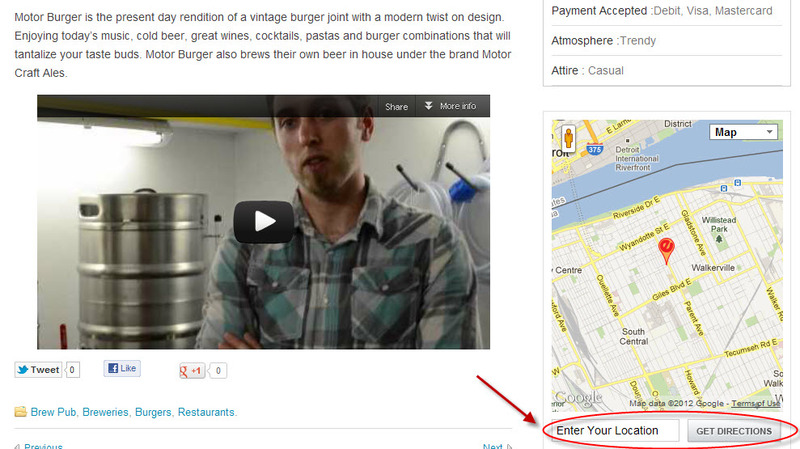 We feel we’ve improved the map and made the “search by location” feature much simpler and much more productive. If you’ve already conducted a search on our site, you may have noticed the word ‘Pinpoint’ next to each search result. Click on this and you’ll be zoomed to the exact location of the restaurant you ‘pinpointed’ on the map above your search results. Yes, we’re still talking about the map. On our old site design, the only map available was the one of Windsor. This is no more. By selecting which town you’re wanting to search through, a new map will be produced for each. 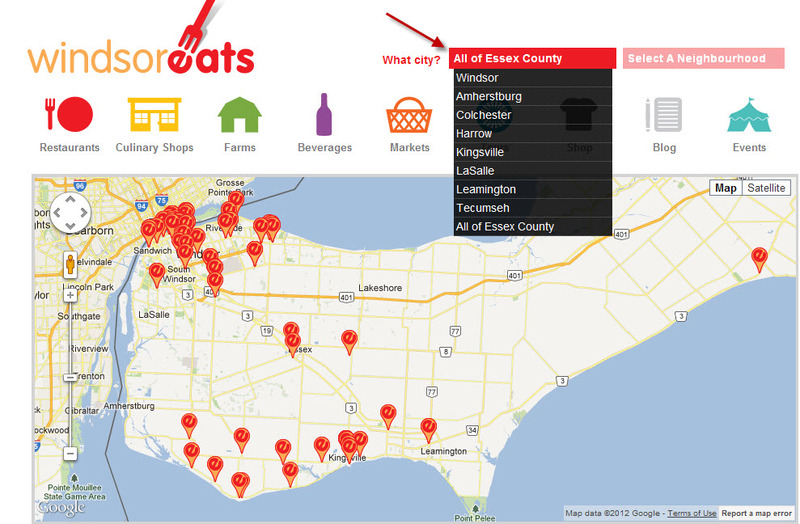 Whether it be Kingsville, Amherstburg or wherever in Essex County, you can now use the map for your culinary searches. Simply type what you want and voila! What you wanted is immediately on your screen. Been to one of our members and wanted to tell everyone about your experience? Now you can! Each business page will allow you to tell the world what you thought of them. This will only be available to those WindsorEats users who are logged in to their Facebook accounts. Connecting opinions and reviews to actual names will help make the feedback stronger, therefore helping you make a better dining decision. We’ve not only made the photos on the business pages bigger, we’ve included more! These photos are also able to be enlarged so you can see them in better detail. While not every business will use it, business pages will also have the opportunity to include video on their page as well, giving you the customer an even better feel for the establishment. Being big believers in social media, our old design didn’t really offer many options to share your favourite businesses with friends and family on your favourite social networks. We’ve corrected that making as easy as pie….mmmm, pie. We have also included links to each businesses Twitter and Facebook accounts so you can see what they’re doing online for yourself, should you choose to. Yes, we even allow an option to quickly share the business’ page through email. First time trying to get the restaurant you’ve chosen? Fear not! There is now a smaller Google map on each page that allows you to put in your current location and provide you with the best directions. Ya, it’s a pretty awesome addition. 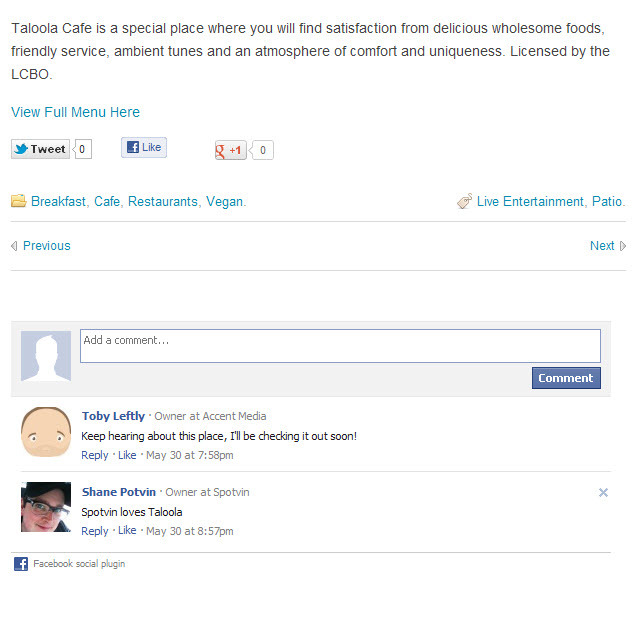 Underneath the small map mentioned above, there is now an ‘In The Neighbourhood’ feature showing you a few restaurant in the immediate vicinity of the business whose page you’re on. 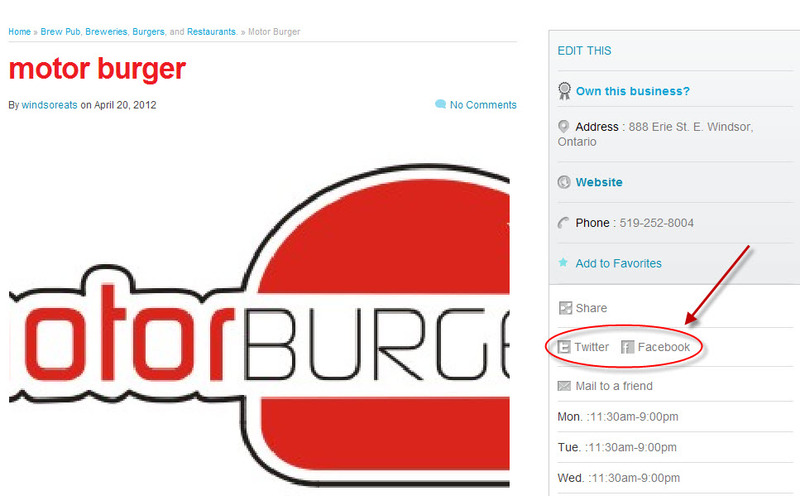 In addition to the ‘In The Neighbourhood’ feature, there will also be 3 restaurants listed at the bottom of each business page showcasing 3 other businesses that are similar to the one whose page you’re currently on. This really has no bearing on any functionality or new design of the site, but I did just want to point out that the WindsorEats logo no longer has the .com at the end. Our reservation system was so popular, we’ve decided to upgrade how it functions to make it more seamless for you, the customer. However, we were so excited to get you the new look of WindsorEats we decided to launch the redesign before our new reservation system was completed. As a result, we have temporarily removed this service from the restaurant pages. Make no doubt about it, though, that it will be returning and very soon!